Diamonds are more than sparkly rocks. Whether you are about to buy a diamond or just researching a term paper you may be interested in diamond facts and information. Some of the most interesting diamond facts involve the importance of the diamond throughout history. It has played an important role in religion, economy, art, and culture since the first diamonds were gathered and polished. Diamonds have been valued as a gemstone for thousands of years. Although they were mentioned in the Bible, in Exodus, some scientists believe that other minerals may have been called diamonds as well. Diamonds were originally not mined but found along riverbanks. These early diamonds were reserved for kings and priests. Kings would stud leather breastplates with rows of diamonds to keep them safe on the battlefield. The diamond engagement ring got its start when the Archduke Maximilian of Austria gave a diamond ring to his intended, Mary of Burgundy. More than likely the diamond for that ring came from a mine in India. India was the most important source of diamonds from the 12th century B.C. until diamonds were discovered in Brazil in the early 1700s. These diamonds were eagerly mined and exported to the point that the deposits were nearly gone completely when extensive deposits of diamonds were discovered in South Africa in the 1860s. A farmer visiting a neighbor noticed the neighbor's son playing with a beautiful pebble. He admired it and it was given to him by the boy's mother, who stated that there were plenty more around the farm. Later, the pebble was identified as a 21 carat diamond, which was named the Eureka Diamond. This find sparked a diamond rush in 1870. 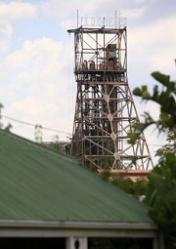 De Beers founded De Beers Mining Company during the height of the rush in 1880. De Beers currently control the export about 90 percent of the diamonds from South Africa. The company employs an estimated 20,000 people on five continents in different phases of the diamond production process. The rich deposits in South Africa made diamonds available to the general public for the first time in history. Blue diamonds are caused by the presence of element Boron in the stone. Red, brown, and pink diamonds are caused by a crystal lattice defect which occurs during the formation of the diamond. Yellow diamonds are caused by nitrogen in the diamond. Green diamonds occur when the diamonds are exposed to natural radiation within the earth. Black diamonds are not black but have enough dark inclusions to make them look black. There are many other facts about diamonds that cannot be categorized easily but are still interesting. Approximately 65 percent of the world's diamonds come from South Africa. The Kimberley Process Certification System is a United Nations backed system that has nearly eliminated conflict diamonds in Africa. The money made from diamonds in Botswana allows each child to receive a free education through age thirteen. Only about 20 percent of the diamonds mined will be made into a gemstone. The vast majority of diamonds are used in industry. Diamonds have been found in meteorites. 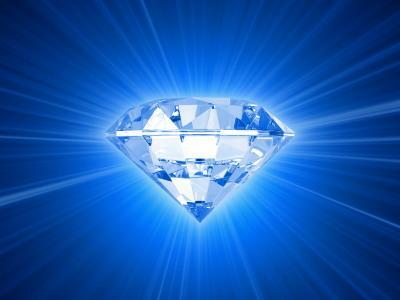 The word "diamond" comes from adamas, Greek for "unconquerable and indestructible." The Crater of Diamonds State Park in Arkansas is the world's only diamond mine that is open to the public. Anyone can go there and search for diamonds. The largest diamond ever found was the Cullinan. It was 3,106 carats. If you heat a diamond to 1405 degrees Fahrenheit it will simply disappear without any ash or residue. Diamonds are brittle and will break if hit with a hammer. The way a diamond's weight is measured is by the carat. The word carat is derived from the carob bean. In the past diamond dealers used to balance their scales with carob beans, which had a basic uniformity that helped keep scales more accurate. Throughout history the diamond has been a symbol of strength and love, associated with magical powers and some are even believed to carry a curse. Entire books have been filled with diamond lore and diamond facts to satisfy the curiosity aroused by these beautiful gems.